Whoever snagged that got a great deal , I've had one for several years and that's only the second lefty I've ever seen, so they are rare. Definitely my favorite headless of all the ones I've played over the years- this one has stuck around and has some pretty serious road wear on it, which speaks volumes as to what an excellent bass it is. 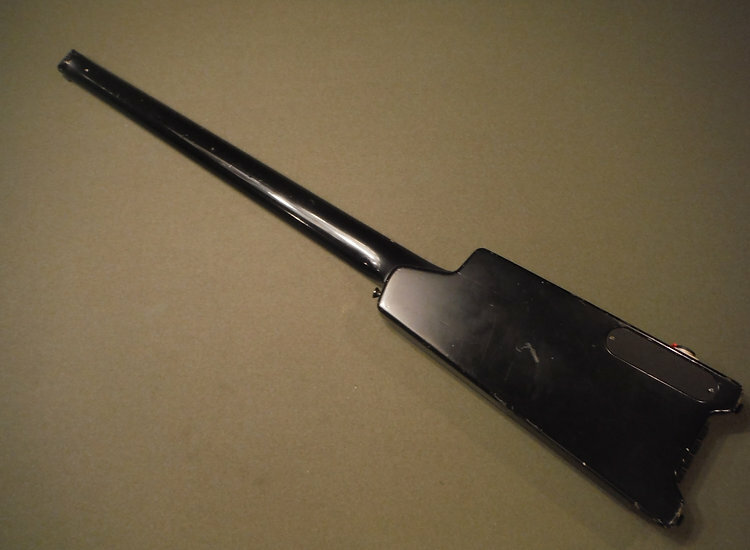 Shortly after Steinbergers were introduced, many international builders rushed to mimic the design and produce lower cost alternatives. 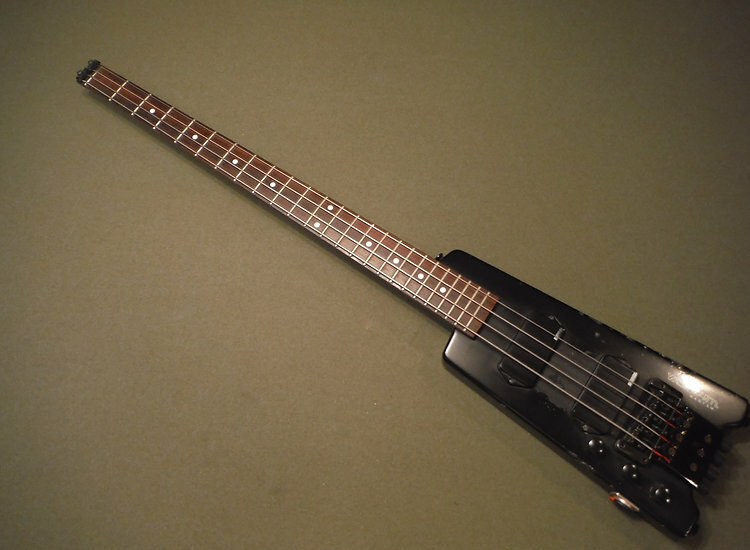 Ultimately, Steinberger decided to license some of these builders to provide legitimate lower cost Steinberger copies... however, before Steinberger started licensing, the Japanese designers produced several unlicensed "interpretations" of the headless design which were quite innovative and interesting in their own right. Among these were the now often sought Ibanez Axestars, Yamaha BX series- and of course the Washburn Bantam headless series, introduced around 1984 or so and built in the legendary Matsumoku factory. The Bantam a is full scale bass featuring two passive high output OEM humbuckers with standard 2 vol 1 tone controls- a simple layout but produces excellent tone and variety. The bass uses regular bass strings, not a double ball end string. The ball end is anchored into the bridge (which is also not an exact Steinberger copy- actually imo it's better, as a Steinberger bridge can sometimes get sticky and can be hard to adjust without some tweaking). The Bantam bridge operation is as smooth as butter. The string ends are clamped down at the head and held firmly into place behind the zero fret, eliminating the need for a double ball end to fasten the string securely to the end. Lastly, in keeping with the early 80's Washburn/Matsumoku high standard of craftsmanship it features neck through construction and high-end locking input jack. Last edited by Carmine on November 6th, 2018, 5:22 pm, edited 1 time in total. Well crap, I wish I had bought it now. The fact that it can use any string is what sold me. Thanks for chipping in, Carmine. 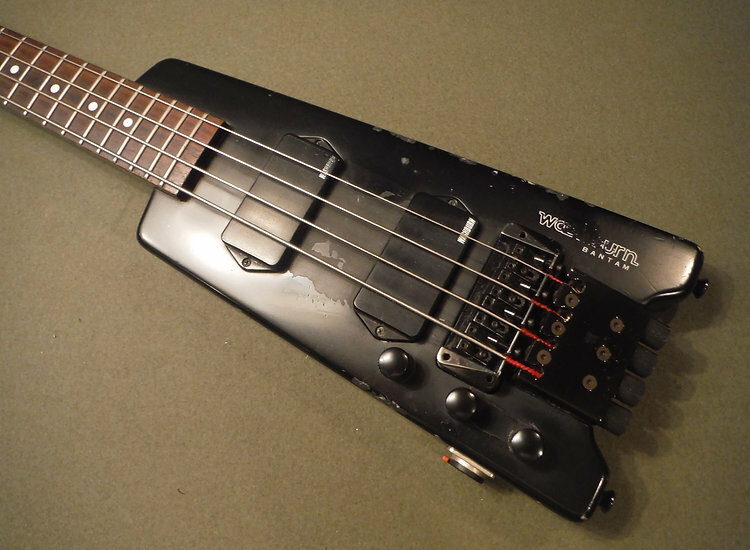 Your near endless knowledge on all things lefty basses is always very welcomed!